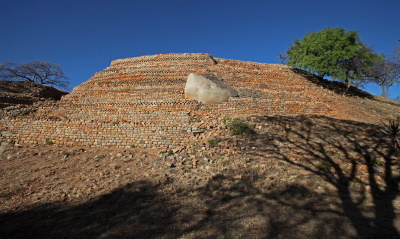 Khami Ruins National Monument comprises the archaeological site of the next capital after the abandonement of Great Zimbabwe. Khami grew between 1450 and 1650. It has the same lay-out in sectors, between the chief's residence and a spread out area with huts for the common population. Imported goods like Ming porcelain and Spanish silverware were found, which hint on wide range trading contacts. A visit to Khami ruins is worth every penny. The ruins have been restored and are beautiful. So if in Bulawayo it is something not to be missed. i think that Khami Ruins is worth a visit. Khami also has a larger number of walls with decoration than Great Zimbabwe, the most common forms being a check pattern and lines of darker dolerite stones. Despite these architectural differences, Khami clearly belongs to the same cultural tradition as Great Zimbabwe. At both sites the stone structures were associated with status and prestige while the majority of the population lived in huts outside the stone walling. If you are in Bulawayo, or the vicinity i would strongly recommend a Visit to the Khami Ruins. It is perhaps a bit surprising that both Great Zimbabwe AND Khami ruins are registered as separate WHS. They are however from different, albeit related, cultures. Historically the former preceded the latter. My personal view is that, unless you are either a “WHS nut” or particularly interested in pre-colonial African ruins/history then you should concentrate your efforts on getting to Great Zimbabwe and give Khami a miss. If you are in Bulawayo then Khami is only 22kms away but you will need your own transport or have to pay for a tour and the entrance fees for foreigners reflect a certain lack of realism as to the value of what is “on offer”. Khami is a court complex of the Torwa state from around the 15th century. Like all “Zimbabwes” the palace is built on a hill and a number of stone walls from the structures partially remain. I didn’t personally didn’t find it a particularly worthwhile place to visit.